Collectors who can successfully guess the player who will be Upper Deck’s “Rookie of the Week” will be entered into a drawing to win a box of 2009 NFL cards. For helping the Detroit Lions break their NFL record losing streak, Matthew Stafford has been given top honors for this week. 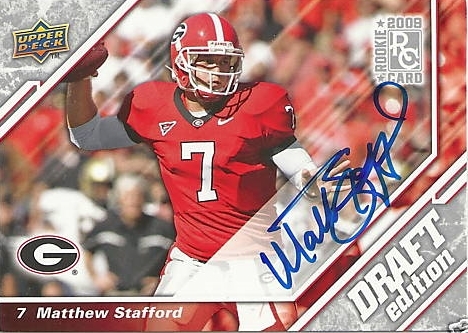 If you entered codes from Stafford’s cards last week, stay tuned to the website to see if you are a winner! Many thought that the Lions could stretch their losing streak to an epic twenty games or more, unless some luck came their way. Last Sunday, Matthew Stafford proved that maybe luck wasn’t the only thing they needed. For the first time in almost two seasons, the Lions went up early thanks to a beautiful TD pass from Stafford to Bryant Johnson, and he played practically mistake free until the final gun. Stafford racked up close to 250 yards in passing and was able go without a turnover for the first time this year. He also rushed for 23 yards, helping the sometimes outmatched defense play without the pressure of the streak on their shoulders. Stafford was the consensus overall number one pick coming out of Georgia, but not everyone thought the Lions should go in that direction. After putting up a poor performance in week one, and struggling in week two, the critics started chirping that Stafford needed more time to develop on the bench. After the game on Sunday, the tide seems to have changed. Ever since the Lions started their streak of incompetence, QB play had always been at the forefront of the disasters on the field. They had Calvin Johnson, but no talent to get the ball to him. Stafford was drafted to help with that problem, and up until the Redskins victory, was not necessarily living up to the billing. Many teams are going to start to avoid the adjustment year that new QBs usually require to be successful because of the stellar play from Matt Ryan, Joe Flacco, and Mark Sanchez (Upper Deck’s first Rookie of the Week this year), but not everyone can fit into that mold with ease. Stafford is also playing on one of the worst teams in NFL history, so its going to be tougher for him to do well with no experience. Even though Mark Sanchez may be the rookie toast of the league at the moment, Stafford definitely should not be ignored. He has shown flashes of brilliance despite working with a bad offensive line and one receiver. This has lead to some of the top card values of the 2009 rookie class, despite the fact that the Lions are 1-2. Regardless, Stafford will be very good, especially with the likes of Calvin Johnson and Kevin Smith playing around him; even more so as tight end Brandon Pettigrew starts to fit into his role. When it comes to the cards available right now, there are quite a few that I would suggest picking up as soon as possible. First, when SPx is released this week, Stafford should have one of the more valuable rookie jersey autographs in the set. It will feature three swatches of player worn jersey, and will be numbered lower than many of the other releases so far this year. Others I would keep an eye out for are his autographs out of UD Philadelphia, as some of the inscriptions he did are the best of the set. Because his autograph is so clear on every card he signs, having a hard signed example like the ones on the 5×7 box toppers out of the product can be an amazing centerpiece to any Lions collection. If you can find the one he signed “Lion King,” I may have to hunt you down for a trade, as I think it was one of the more brilliant autographs I have ever seen. 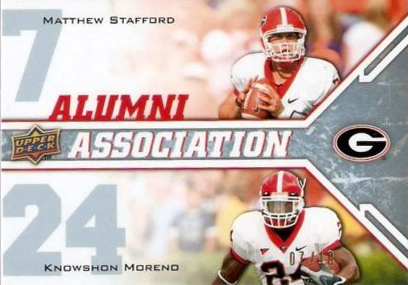 Lastly, Stafford had some great cards in UD Draft, especially the dual autographs with fellow Georgia Bulldog Knowshon Moreno. 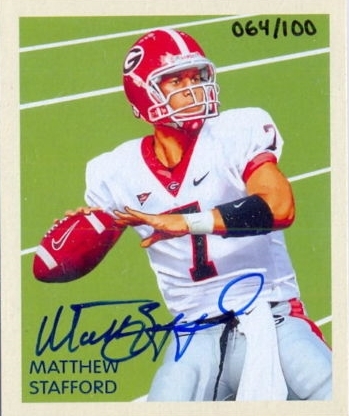 The base draft auto is another hard signed autograph card, and should be pretty affordable for the people who can’t spend much money on one. If you can get one of the duals, it wouldn’t be too bad of an investment considering that Moreno also had a great week. Overall, Matthew Stafford should be hailed just for being the one to put a tick in the win column for the Lions, but its becoming more apparent that he is going to be great in the coming years. As the Lions improve (and they will), Stafford will too, so don’t be afraid to start your collection now while things are cheaper. He has the skills to be great, though having Johnson to throw to should help just as much.